Will Italians love Starbucks coffee? Popular shopping chain, Starbucks, will tomorrow open its first shop in Italy, which will be based in Milan at the Palazzo delle Poste building, designed in 1901. Work on the coffee shop has been going on for more than two years, however the completed product is now expected to leave different affects from other establishments already owned by Starbucks, with the exception of the two roasteries opened in Shanghai and Seattle. 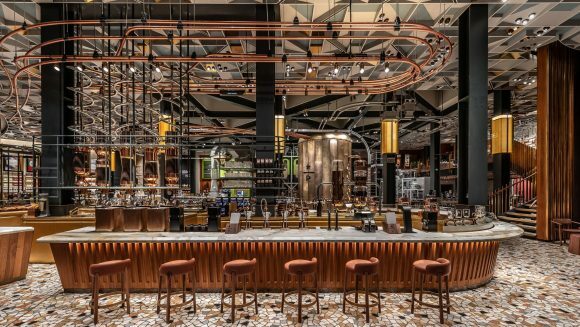 The Starbucks Roastery in Milan is furnished with marble pavements and wooden panels on the walls and ceilings that provide a luxurious image and complements with the Italian coffee tradition. Apart from the principal coffee drink, the shop will also offer a variety of cocktails and ice creams, and also bakery and pizza cooked in a firewood oven. The question now is will the American coffee be accepted by the Italians, who are proud with their coffee and are still loyal to their traditional capuccino and espresso. Meanwhile, it was announced last month that Starbucks will also open a shop in Malta next year.